Here is a new Loeb Classical Library edition of Homer's stirring heroic account of the Trojan war and its passions. The eloquent and dramatic epic poem captures the terrible anger of Achilles, "the best of the Achaeans," over a grave insult to his personal honor and relates its tragic result--a chain of consequences that proves devastating for the Greek forces besieging Troy, for noble Trojans, and for Achilles himself. The poet gives us compelling characterizations of his protagonists as well as a remarkable study of the heroic code in antiquity. The works attributed to Homer include the two oldest and greatest European epic poems, the Odyssey and the Iliad. 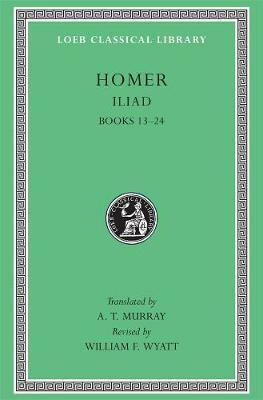 These have been published in the Loeb Classical Library for three quarters of a century, the Greek text facing a faithful and literate prose translation by A. T. Murray. William F. Wyatt now brings the Loeb's Iliad up to date, with a rendering that retains Murray's admirable style but is written for today's readers. Augustus Taber Murray (1866-1940) was Professor of Greek at Stanford University. William Frank Wyatt (1932-2011) was Professor of Classics at Brown University.